This post was written by Kimio Honda, Studio Manager in WCS’s Exhibition and Graphic Arts Department. 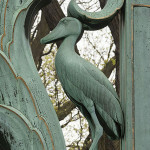 This is the third part of a three-part series on the Bronx Zoo’s Rainey Gates; for part 1, on Paul J. Rainey, see here, and for part 2, on the development of the Gates, see here. 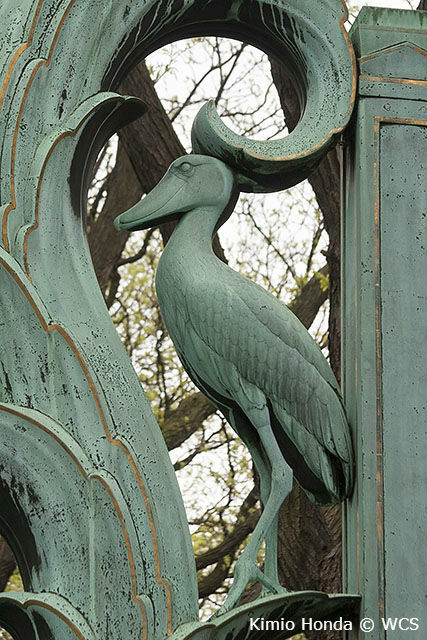 While working on the Rainey Gates, Paul Manship was able to sculpt from the animals at the Bronx Zoo, as they were brought into a special studio—likely the artists’ studio that sat at the northeastern corner of the Lion House. (See our previous post on the studio.) 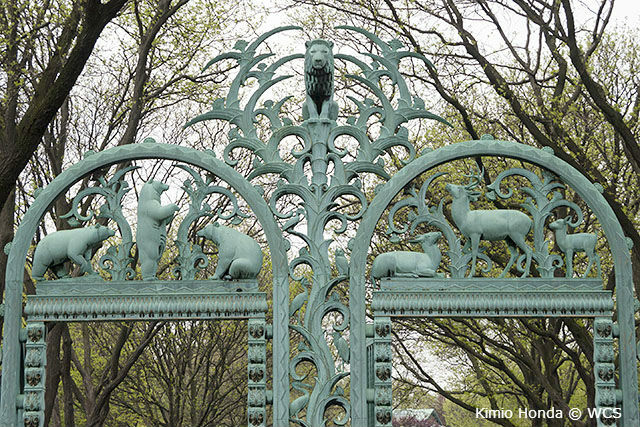 The animals featured in the gates were chosen from the actual zoo collection. Some of them were well-known characters. At the top of the center column sits Sultan, the male lion who appears in many photographs and Bronx Zoo postcards from the era. 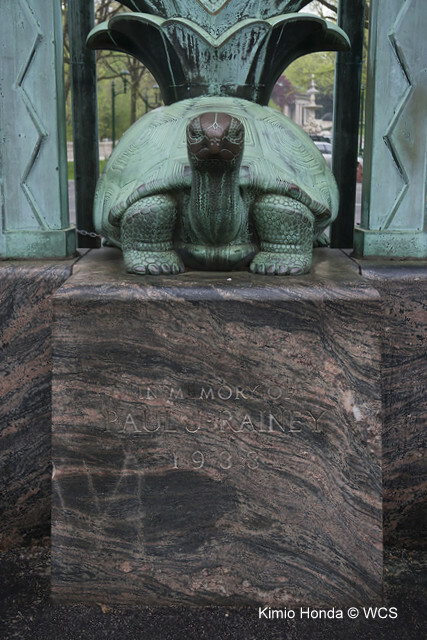 All three posts are held at the base by Galapagos tortoises modeled after a tortoise named Buster and are probably a nod to the World Turtle mytheme from ancient India, China, and Native tribes of North America. I was always curious about the shoebill stork embedded in the right post, since it is not the kind of species often seen at zoos. Then, while looking back through William Bridges’ Gathering of Animals, I recalled Jimmy the shoebill. Jimmy was a favorite subject for many artists, as he stood motionless for a long time. Among such artists was Roger Tory Peterson, who, according to Bridges, made at least a hundred sketches of Jimmy. Apparently Jimmy was quite a celebrity and his stories will have to be covered by a post of its own. 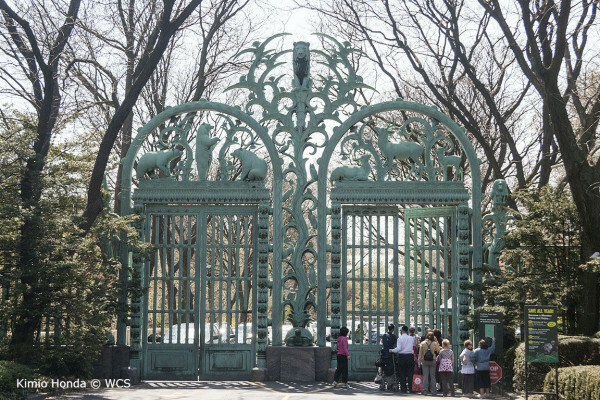 Due to their orientation, the front of the gates is almost always backlit, and the trees on the sides have grown quite a bit, making it hard to photograph the entire gates very well. A closer look reveals gold trimmings that add a sophisticated touch of class. It is done in such a reserved, tasteful way you will never notice the feature unless you come within a few feet. So, what if the Rainey Memorial Gates were moved to a more prominent location? 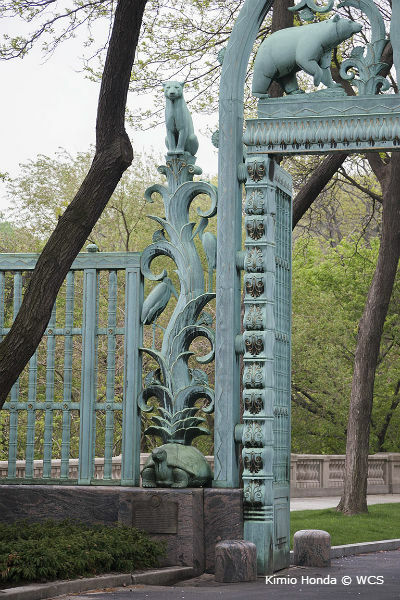 In fact, if my memory serves well, John A. Gwynne, former head of EGAD, proposed in 2000 to move the gates to the Bronx River Gate entrance as a part of rethinking the overall park access. 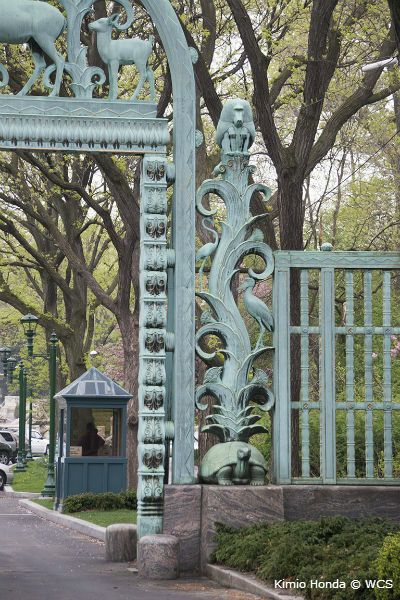 It would have given the gates the kind of exposure they deserve, but the practicality—or lack thereof—appears to have killed the idea quickly. 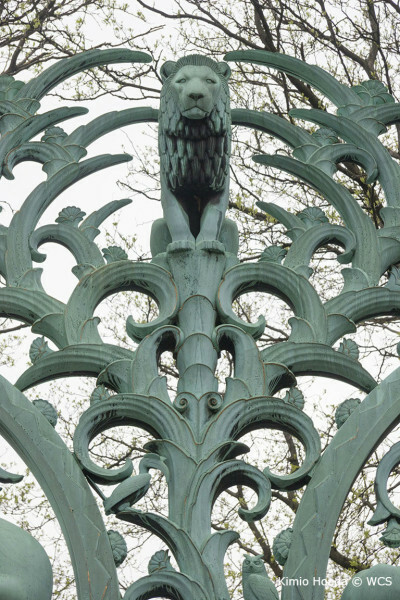 The Rainey Memorial Gates were designated as a historic landmark by the Landmark Preservation Commission of New York City in 1967. I recommend anybody visiting the Bronx Zoo take a close look at this beautiful work of art. Dear Mr. Kimio Honda, Studio Manager in WCS’s Exhibition and Graphic Arts Department ! We still preserve several of the original moulds of the casting of the Zoo gate, as for example the mould for the bear. We also have a film in our posession which shows the casting, shipping and assembly in New York of the gate. I hope this will interest you and we could get into contact. I myself am a freelance guide with the Foundery and would be pleased to give you more inforamtion. This is very exciting news, Leo! I’ve just sent you an email so we can discuss further. Thanks for contacting us!